Urine is one of the primary ways your body gets rid of things it doesn't need. However, urine shouldn't contain high levels of protein. Too much protein in urine, a condition called proteinuria, is a sign of kidney damage. The good news is, you can help reduce the amount of protein in your urine with some changes to your diet. Soy protein may offer numerous benefits for damaged kidneys. Animal proteins are high quality but hard on the kidneys and you may need to limit them in your diet. Vegetable proteins are less taxing and soy fits the bill as a high-quality vegetable protein. It might also help reduce proteinuria, according to a study published in 2003 in "Kidney International’’ which had patients follow a commonly recommended renal diet consisting of 70 percent animal protein and 30 percent plant protein followed by a diet consisting of 35 percent soy protein and 30 percent other vegetable proteins. Researchers found the addition of soy to the diet appeared to reduce proteinuria and improve renal function overall. 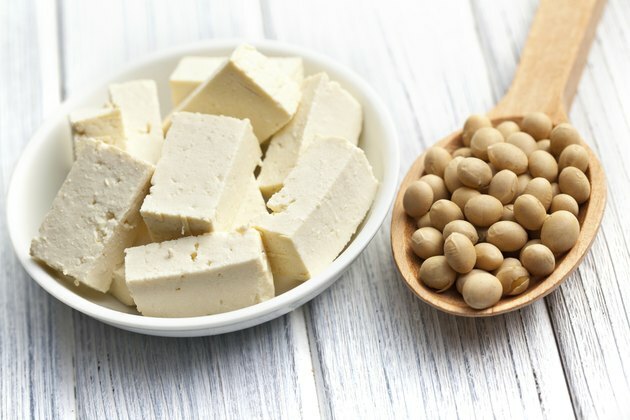 However, you'll need to choose the right soy products, according to registered dietitian Joan Brookshyer, writing for the American Association of Kidney Patients, who notes that many soy-based meat and cheese substitutes can be high in sodium, another nutrient you may need to limit in your diet. Read packages carefully. A study in the December 2003 issue of ‘’Kidney International’’ suggests flaxseed meal might reduce proteinuria. Dutch researchers had diabetic rats likely to develop kidney disease follow either a diet consisting of 20 percent casein — the protein found in milk, 20 percent soy protein or 20 percent flaxseed meal for six months. All other aspects of the diet were the same in all three groups. The researchers found that the amount of protein excreted in the urine of the flaxseed-fed rats was lower in the soy diet than in the other diets. The rats in the soy group also had fewer damaged glomeruli – the tiny filters in the kidneys. A study of this nature is not enough to make any firm conclusions, but given the relative safety of adding this food to your diet, you may want to ask your physician if you should add it to your diet. If you have kidney damage, you often need to watch your intake of sodium, as it may help reduce proteinuria, according to a study published in the July 2011 issue of ‘’The British Medical Journal.’’ Researchers <ahref="https: www.ncbi.nlm.nih.gov="" pubmed="" 21791491"=""> </ahref="https:>divided participants into a reduced-salt diet in combination with ACE-inhibitors, a medication used to treat proteinuria; a low-salt diet and placebo; a regular sodium diet with the medication; or the placebo with a regular sodium diet. The reduced-sodium diet appeared to reduce proteinuria the most. Healthy adults should limit their sodium intake to no more than 2,300 milligrams daily, but limiting sodium intake to no more than 1,500 milligrams per day may offer greater health benefits. The National Kidney and Urologic Disease Information Clearinghouse stresses the importance of keeping your blood sugar under control if you have proteinuria. Consistently high glucose levels damage the kidneys. Talk to your dietitian about the amount of carbohydrates you should eat every day. You need to limit sugar and refined carbohydrates, both of which elevate blood sugar levels. Focus on fiber-rich carbohydrates, such as whole grains, whole fruits and vegetables. While rich in nutrients, starchy vegetables such as potatoes and corn can also raise blood sugar when eaten in excess. Can Protein Shakes Increase Blood Pressure? Can Foods and Vitamins Stop DHT?